The holidays are officially here! As part of our beauty routines as women, hair removal is a common (albeit hassle-some) practice. How we choose to remove is a personal choice and thankfully these days there are so many options available for us out there. I use a mix of different types of hair removal for different areas of my body from shaving my legs to threading my brows and waxing everywhere else. 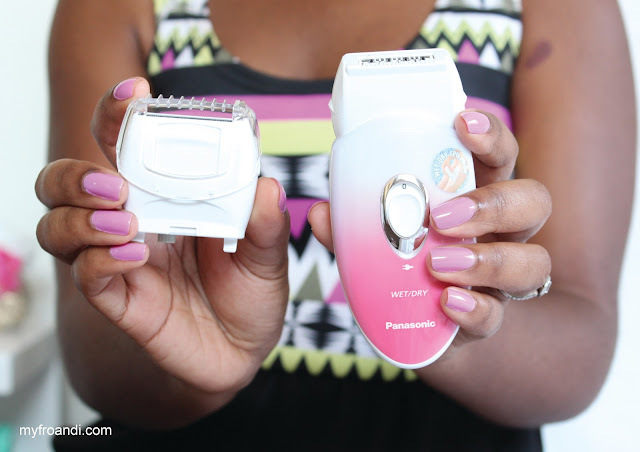 So I’ve tried it all but I’ve never tried an Epilator…until last week! 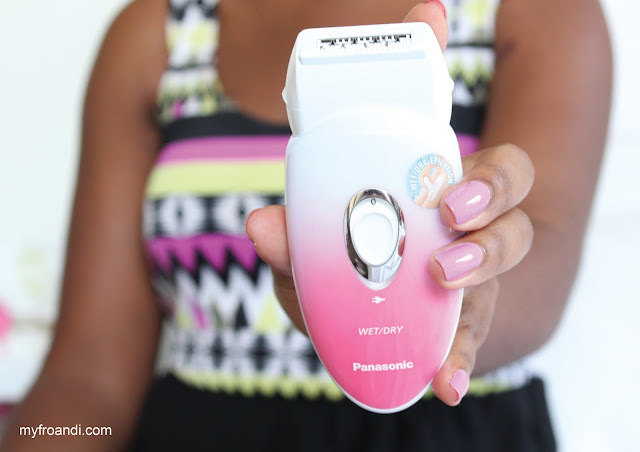 An epilator is a hair removal tool that has multiple tweezers that rotate. The tweezers grip your hair as it’s moved over your skin to pull the hair out from the root. So imagine an electric shaver but with tweezers on the head instead. Panasonic recently released the world’s first range of foaming epilators. The one I used is suitable for wet or dry epilation which is quite unique. It also comes with a shaver to shave, a cover and comb so you can clean the head easily. 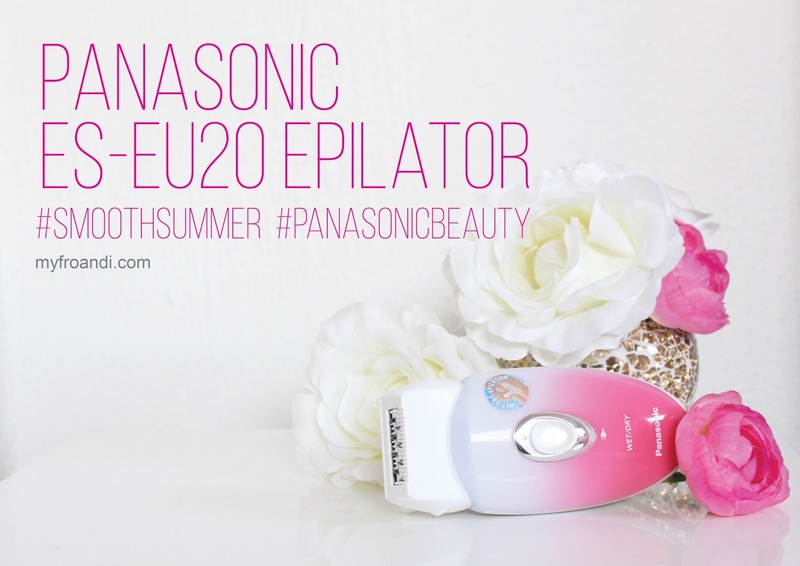 The Panasonic Epilator promises to leave your skin feeling and looking smooth for longer. Because your hair is being removed from the roots, it doesn’t grow back to the surface as quickly and it also comes back finer. Firstly, I did a bit of research as I was a newbie to this. Enter YouTube! I watched a couple of videos that gave some tips on how to epilate. I’m prone to ingrown hairs so to prep for this, I used my exfoliating gloves to gently exfoliate my legs. I also made sure to use warm water to help open up my pores. At first, I used the epilator on dry skin, but then decided to try it on the wet function. For this, I just wet my skin and put a little blob of my shower gel onto the head of the epilator. When I switched it on, it started foaming straight away. I then put the epilator at a 90 degree angle against my skin and moved it up my leg in the opposite direction of the hair growth. The foam definitely helped with this movement as it was easier to glide over my skin than when I tried it dry. As with other hair removal methods that remove from the root (ahem waxing), the process itself isn’t a walk in the park. It was quite painful for me the first time, which a friend of mine who regularly epilates warned me about. But by the time I went over some areas again to get any hairs that escaped, it wasn’t as uncomfortable. The process itself took a little longer than when I shave as I had to go over some areas a few times to make sure I got every hair. There’s nothing worse than patchy legs! When I was done, I rinsed my legs with lukewarm water and towel dried. Because many of the YouTube videos gave an heads up that the skin could get spotty and irritated from it, I applied my trusted aloe vera gel which I also use after I wax just to sooth my skin. I did this a week ago and I haven’t gotten any ingrowns – yay! What a triumph. I’m not going to lie, this probably excited me the most about epilation. Only fellow sufferers of ingrown hairs would appreciate my excitement. This epilator was really easy to use for a newbie like me. It’s a cost saving exercise since it’s a once off payment of R799 and it’s promised that the discomfort gets better after repeated use. There’s a limited pop up shop live on Beauty Bulletin that offers it for just R699. My hair grows fast so I’m looking forward to not having to worry about my legs for a little while I enjoy a #SmoothSummer. My hair is currently in its natural state. I love my hairs thickness, its naturally thick. I disliked that for some reason, that the universe is not telling me, I am not gaining length. And protective styles have damaged by hair line. I have been natural for 5 years now and will never go back to relaxers. I am hoping that it will add moisture to my hair and make it feel supple. I need that Intensive repair and daily moisture in my life. Overall I love doves mantra, to me it says the original you is the best you. Aisha!! Happy new year, lady. Please come back. We miss you, your pwetty face, yummy fro and awesome posts. So please cooome baaack. I trust you are well though and that you had an amazing break! Looking forward to the stuff you have planned for this year. I've been epilating my underarms since March – it really does get less painful with time, now I do it in less than 3 minutes each side. It also helps to exfoliate underarms regularly to prevent ingrowns. Nice, I would try my underarms but they're soooo sensitive! Tho. You are all kinds of brave. I dread hair plucking of any kind.But it sounds like its worth it. Not having to shave for a while sounds tempting.